Dylann Roof Sentenced To Death In Murder S.C. Church Killings : The Two-Way Dylann Roof, 22, murdered nine people in the basement of a historically black church in Charleston, S.C. He told the jury that prosecutors "don't know what real real hatred looks like." 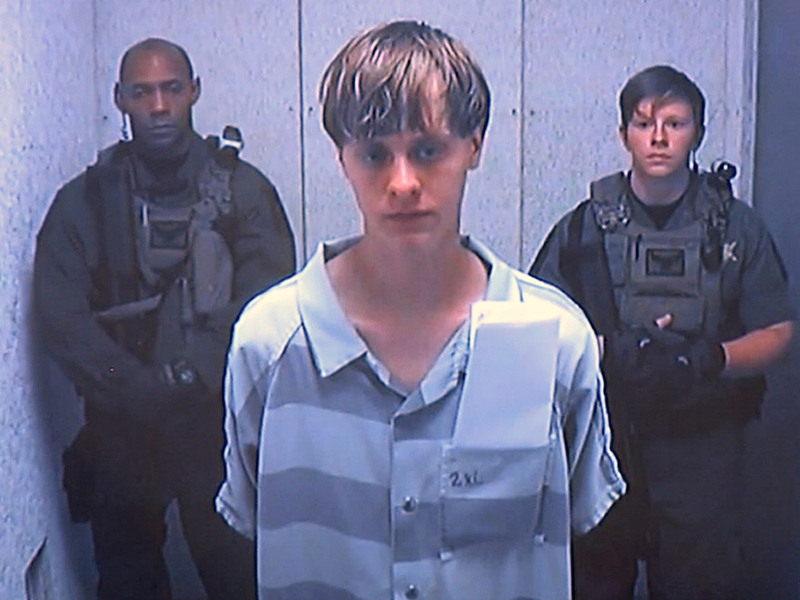 Dylann Roof appears via video before a judge, in Charleston, S.C., on June 19, 2015. A jury has sentenced to death the man who murdered nine people in a Charleston church basement in 2015. The twelve jurors deliberated for about three hours before sentencing Dylann Roof, 22, to die. To impose the death penalty, they had to reach a unanimous decision. It is the same jury that found Roof guilty of federal hate crimes charges for entering Emanuel African Methodist Episcopal Church in June 2015 and sitting among those at a Bible study in the basement before opening fire on the worshippers. The sentencing portion of the trial began Jan. 3 and ended on Tuesday. Survivors, family members of those killed and law enforcement officials testified for the prosecution about Roof's crime, the lives he cut short and his apparent motives. Family members of Cynthia Graham Hurd, one of the victims, talked about Hurd's love of books, which led to her work as a librarian, reported Charleston's Post and Courier newspaper. After the sentence was announced, Hurd's brother Melvin Graham told reporters outside the courthouse "It's a hard to say that this person deserves to live when [the] other nine don't," tweeted Post and Courier reporter Abigail Darlington. "He was radicalized," Graham continued. Another victim, Ethel Lance, was remembered as the matriarch of her family. "The oldest of Lance's children, the Rev. Sharon Risher, held up her hands in the witness stand and pretended to rip apart a piece of fabric representing her family.
" 'Nobody is there to keep us together, to keep the pieces together. Now we have tattered pieces,' Risher said tearfully. 'And I know that would devastate her.' "
Federal prosecutor Jay Richardson argues for 2 hours #DylannRoof should be sentenced to death for crimes. FBI Special Agent Joseph Hamski, who led the federal investigation, told the jury that Roof had an account on the white supremacist website Stormfront.org under the username "LilAryan" and posted messages in the months before the massacre, looking for other local people who shared his views, the paper reported. In his closing argument, which lasted about two hours according to South Carolina Public Radio's Alexandra Olgin, prosecutor Jay Richardson argued that Roof deserved to die for his crime because he planned a deadly race-based attack in an attempt to incite further violence and had shown no remorse. "He said it's 'absolutely true' that he chose to represent himself so that his lawyers would not present evidence of mental illness.
" 'The point is I'm not going to lie to you,' Roof said. 'There's nothing wrong with me psychologically.' "
In a rambling, five-minute closing statement on Tuesday — his last chance to address jurors before they decided whether to sentence him to die — Roof spoke about hatred.
" 'Wouldn't it be fair to say that the prosecution hates me since they are the ones trying to give me the death penalty?' he said. 'You could say, "Of course they hate you. Everyone hates you. They have good reason to hate you." I'm not denying that. My point is that anyone who hates anything, in their mind, has a good reason.' "
Roof is facing separate murder charges brought by the state of South Carolina, which is also seeking the death penalty. A previous version of this article stated that trial was scheduled to begin Jan. 17, but it has been postponed due to uncertainty that the federal trial would not be completed in time. After the death sentence was announced Tuesday, Roof's defense team released a statement suggesting Roof intends to appeal the sentence, saying "Today's sentencing decision means that this case will not be over for a very long time. We are sorry that, despite our best efforts, the legal proceedings have shed so little light on the reasons for this tragedy."